Christ has no body now on earth but yours; No hands but yours, no feet but yours; Yours are the eyes through which His compassion will look upon the world; Yours are the feet with which He will go about doing good; Yours are the hands with which He will bless others. Throughout history, inspired Christian leaders have been at the heart of vital communities of faith. These individuals serve the common good, strive for justice, share the Gospel and ultimately do God’s work. They enrich the world by creating actionable solutions and centers of care, like hospitals, schools, social services, civic organizations and churches. Young Christian leaders from diverse backgrounds are called to be faithful innovators and change agents of their generation. With support, they will shape the future through communities of faith. Whether you are seeking to discern your vocation, or if you would like to partner with us in supporting young leaders, their teachers and the communities that call them into service, we welcome you. Be a part of our work. To cultivate diverse young adults to be faithful, wise and courageous leaders for the church and academy. 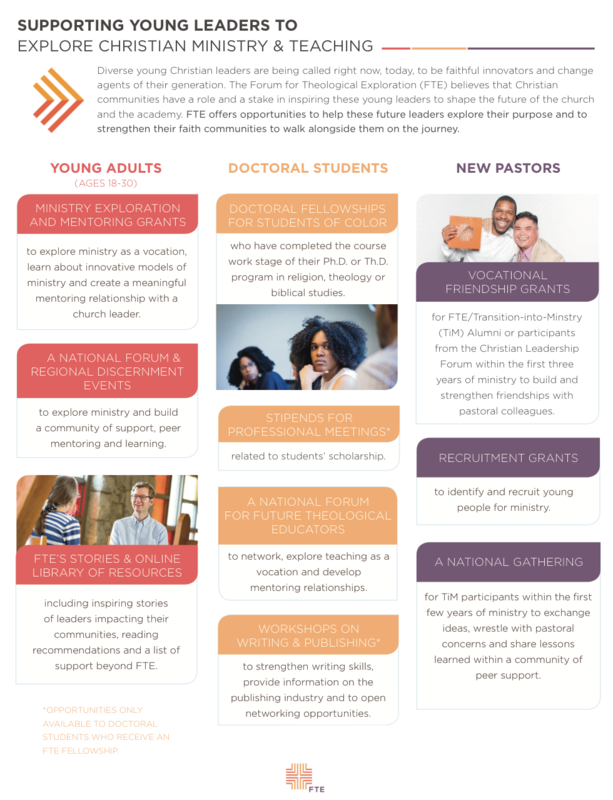 Click here to download a PDF of FTE's offerings.